Kelsey Bowen is from a small town in California where hot summers were often spent outside with dust and thistles in her socks. Her youth was categorized in animals; both the pets that surrounded her and the molded plastic ones she played with, alone, for hours at a time. 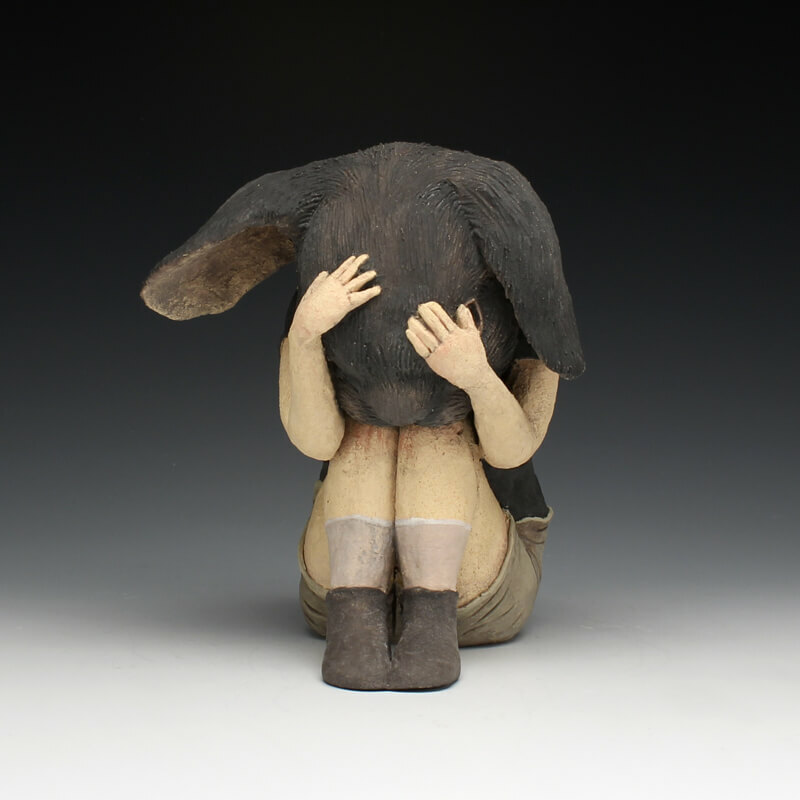 These items and creatures translate into her work as characters and stand-ins for the human form and serve as vessels for her self-reflection, explorations, and storytelling in clay. She sees her work as the illustration of personal narratives and borrowed tales, like the drawings in a children’s book. While often dark in concept, her pieces sweetly invite close inspection through their pastel and soft appearance only to repel or jar with quietly twisted details. Kelsey received her BFA in Ceramics from the California College of the Arts in Oakland, California, and is currently creating work as a Long Term Artist in Residence at the Red Lodge Clay Center in Montana. She has participated in various exhibitions with her work, including a publication in Ceramics Monthly, the California Conference for the Advancement of Ceramic Arts in Davis, the American Museum of Ceramic Arts in Los Angeles, and her BFA solo exhibition in the California Bay Area. I am fascinated by the darkness of childhood, so contrasted against our expectations of what it means to be a child. My work is a collection of tangible illustrations, existing on a blurred line between their own fairytale and our physical space. I find parallels back to youth in our interactions as adults, navigating our lives affected by our pasts and our stories. These connections create pathways through my pieces to follow pastel-colored characters into bright fields of flowers, only to be repelled by their sharp-bladed scissors or fall prey to their devious games. While often being conveyed through gentle colors and blooming innocence, childhood also grows in darker places. My work invites a connection between viewer and sculpture where childhood exists between the fairytale and nightmare. Like looking at the drawings of a children’s book before reading the story, I invite others to find pieces of themselves hidden in the details of my work. My sculptures are often vessels that capture the echoes of small children playing; sometimes the echoes are of my own voice borrowed from the time and place they were created years ago. When I’m working on a piece, I feel in fleeting moments that it’s come to life. I give them bright bows and dark memories, bringing them to reality with whispered stories. Working with my forms and creating these brief moments for myself are my last lingering stitches of childhood and a way to connect back to myself. For a moment, the fantastical objects in my world are alive and the stories I am telling are curiously real.